1:00 pm - 4:00 pm. 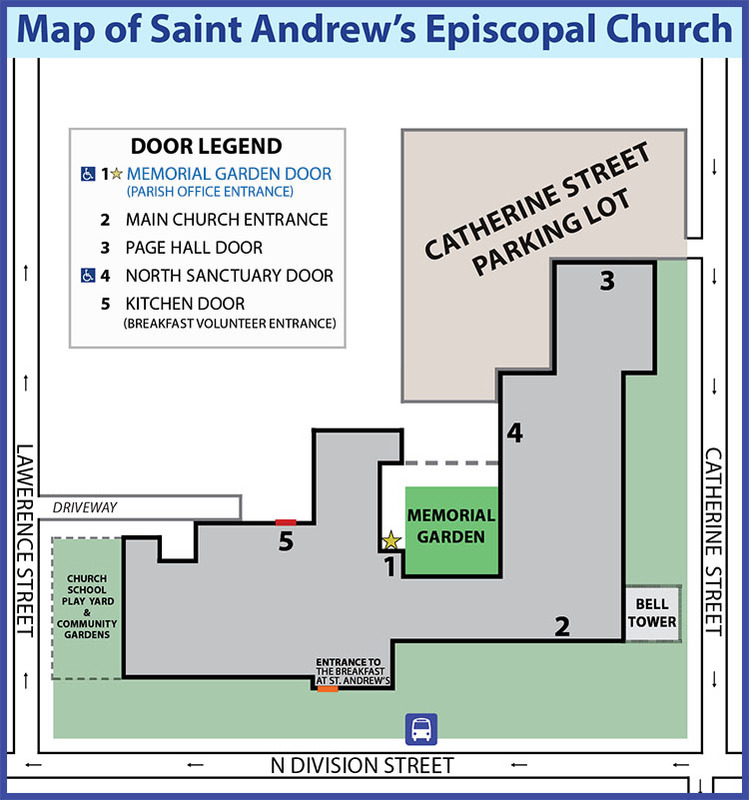 To get to the Parish Office, please enter through the Memorial Garden door (through the metal gates) off the Catherine Street parking lot. If the door is locked, please ring the bell for assistance. We have accessible entrances to both the Sanctuary and the Parish Offices. The Parish Hall (where the Breakfast operates) and Church School classrooms can be reached via elevator located in the lobby, next to the chapel. On Sundays, our Catherine St. parking lot is reserved for handicap parking. For those who have telecoil hearing aids, our Sanctuary is equipped with this technology. Additionally, a large print hymnal and Book of Common Prayer are available by request. The Breakfast at St. Andrew's was founded in 1982 and serves a free hot meal to all in need from 7:30-8:30 am, seven days a week, 365 days a year. Guests can also make a sandwich to take with them for later in the day. To learn more about the Breakfast, visit their website: breakfastatstandrews.org. Volunteers are always needed! To volunteer at the Breakfast please email the Breakfast Volunteer Coordinator, Susette Jaquette or learn more about Volunteering at the Breakfast. Take Exit #3 for Downtown Ann Arbor and go approximately 1 mile. Turn left on Kingsley Street, then right on State Street, and right on Catherine Street. The parking lot for St. Andrew's is on the right-hand side, halfway down the block. Please note that Exit #3 on M-14 is only available for west-bound drivers. Off of US-23, take Exit #45 onto M-14 West. Then take Exit #3 for Downtown Ann Arbor and go approximately 1 mile. Turn left on Kingsley Street, then right on State Street, and right on Catherine Street. The parking lot for St. Andrew's is on the right-hand side, halfway down the block. Take Exit #177 for State Street. Go north on State Street toward downtown for about 5 miles. Turn left onto Catherine Street. The parking lot to St. Andrew's will be on the right hand side, halfway down the block, before the stoplight. There is an AATA bus stop located outside of St. Andrew's on Division Street. There is a small parking lot behind the church that can be reached from Catherine Street. On Sundays it is reserved for those with mobility problems. The lot is open during the week for office and committee business. PERMITS ARE REQUIRED FOR THE PARISH PARKING LOT. Violators will be towed, at their expense by Brewer's Towing. Parking permits for parishioners are available at no cost from the church office during office hours or after services on Sundays. If you do not have a permit, you must request permission from the church office. On Sundays, additional parking can be found on the nearby streets and in the Community High School parking lot. Community High is across Division Street from St. Andrew's, accessed from Fifth Avenue (near Zingerman's). Additional weekday parking can be found in downtown Ann Arbor: METERED & STRUCTURE PARKING. Keep track of how road closures for events such as the Ann Arbor Art Fair, Marathon, Dexter-Ann Arbor Run, or Taste of Ann Arbor may alter your regular route.